Book collectors know that, with modern first editions, the dust jacket accounts for about 80% of the value of a book. However, some might argue that book collectors are also in the business of seeking additional rewards from holding an ironically designed jacket. The cover of William Heinemann’s 1962 edition of Anthony Burgess’s, A Clockwork Orange, is such a cover. Designed by the artist Barry Trengrove, the shocking use of pink and black reflects the violent and disturbing content of the novel. The illustration of the aggressive and tormented face is in line with expectations of the leading character, Alex. Additionally the garbled text pouring out of the speech bubble hint at the unusual language within the novel. Trengrove was a recognised artist of the time and he designed the cover of Leonard Cohen’s first novel, The Favourite Game, (Secker and Warburg 1963). A publication, 17 Graphic Designers London, included Trengrove’s image alongside other leading designers of the time. These included Dennis Bailey, John Sewell and Jock Kinneir among others. Despite the iconic dust jacket on publication the challenging nature of the novel may have baffled the reviewers. Sales of the book were poor in the UK and reviews were mixed. 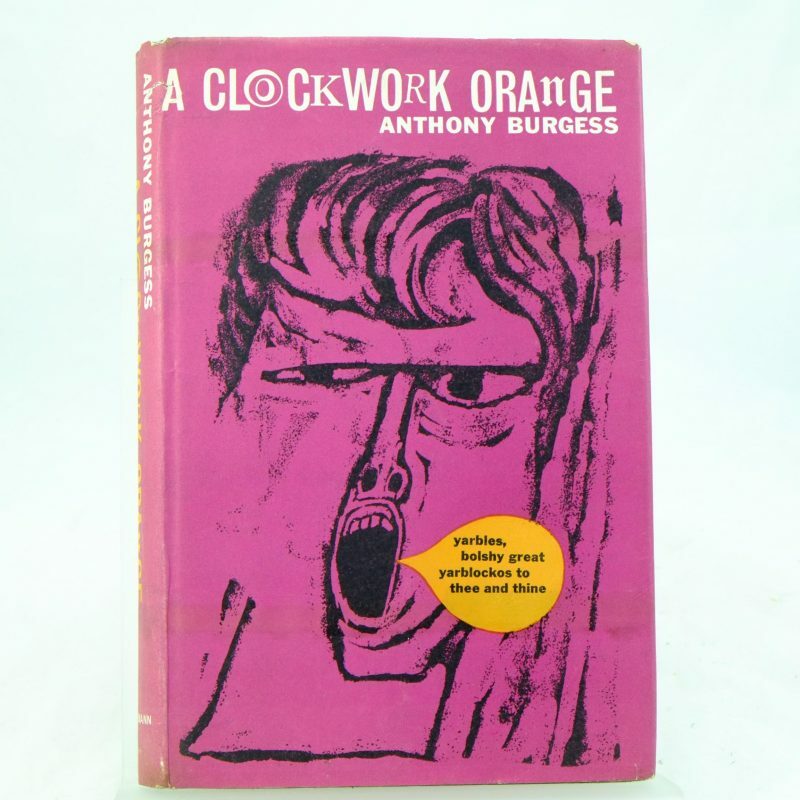 By the mid-1960s A Clockwork Orange had only sold 3872 copies. However, it quickly became an underground hit. It was adapted by Andy Warhol for his Factory film Vinyl (1965). The book did not reach a global audience, however, until its second film adaptation by Stanley Kubrick in 1971. Sales in the United States were more positive especially after the film release. First editions of Trengrove’s dust jacket are characterized by wide flaps and the price of 16s. Second issues have trimmed flaps and are re-priced at 18s. The publishers of the United States first edition was W. W. Norton in 1963. It’s significance is that it has no final chapter. The dust jacket is identified by the $3.95 price on the front flap of the jacket. W.W. Norton Company, Inc. published the first US edition of A Clockwork Orange. This was without the final chapter 1963. Additionally the 184-page edition’s dust jacket states its original price of $3.95 on front flap of jacket. It wasn’t until 1987 that Norton published the “New American Edition,” complete with the final chapter. Further dust jackets were designed after the film release. A memorable design by David Pelham features the cog- eyed and bowler hatted figure. This was used for the paperback edition of the book in 1972. In 2012, Norton published a 50th anniversary edition of the novel featuring the original British cover and six of Burgess’s own illustrations. 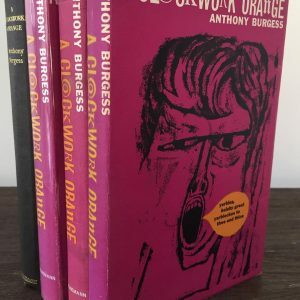 Dust jackets that look good on the shelf as well as being of great value certainly ticks the box for The Clockwork Orange. It certainly remains a book that seems to gain value on both points. Site under construction! Please bear with us whilst we update the website. Thank you.